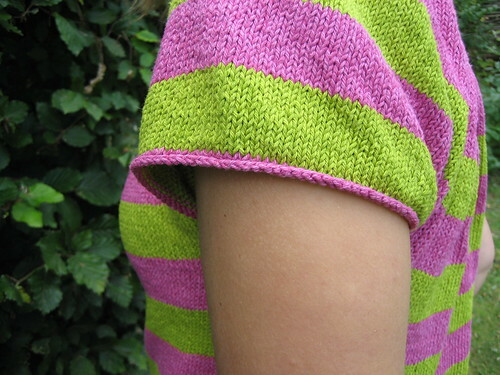 Modifications and thoughts: This top is knit from the neck down. You basically knit a very wide tube past your armpits and then put the sleeves on hold to continue knitting a tube. After finishing off the sleeves you sew around the neckline to make the pleats. I decided to go with the suggestion made by Roko on Ravelry to cast on provisionally and knit the pleats instead of sewing them. I liked the neater look. I also skipped the pocket on the front. With all the stripes going on I figured I didn’t need anything more to make the top visually interesting. And to me the pocket adds more to the look than the functionality of the top. I wanted this to be a floaty top that didn’t cling to my hips, so I added increases to the part below my armpits. To be honest, I think I added too many as there’s a loooot of positive ease going on in the waist and hip area. This is mostly seen at the back, I think, where a lot of the fabric gathers. Had I planned my increases a bit better, I’m sure I could’ve avoided this. It’s not a big deal though, I’m planning on using the top casually. And I absolutely love how heathered the yarn looks when knit up. I love the fabric it produces! 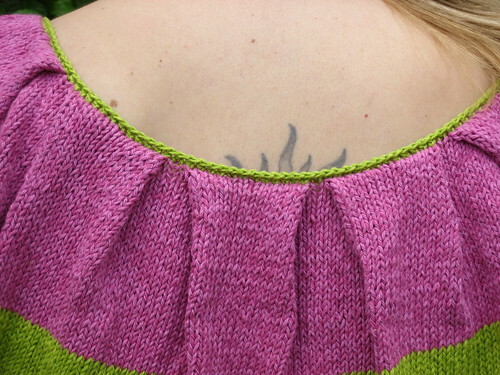 This entry was posted in Creative, Finished, Knitting and tagged knitting, Vesper. Bookmark the permalink. Oh, Anna, that’s so pretty! I want to knit this top too. Love it! Your knits always look so fantastic on you. Lovely job! The color combination is fantastic!